I am not an excitable man. Indeed, kind friends have been known to remark that I display the emotional depth of an iceberg. Yet I do become excited at the prospect of visiting a famous restaurant for the first time. Excited, and sometimes a little anxious – particularly when a chef has created a second dining room. There is no question that Thomas Keller (pictured) is one of the most talented chefs in the world, nor that his restaurant in the Napa Valley, The French Laundry, is one of the world’s best. But star chefs have been known to spread their talents too thinly. As I clambered out of the yellow cab on Columbus Circle, I feared that his new venture – Per Se, in far away New York – might not maintain the standards of the Californian original. Friends, I need not have worried. Per Se is, without doubt, one of the finest restaurants in the world. And here, I think, I must allow myself a Lady Bracknell moment. (Please adopt the intonation of Dame Edith Evans.) To create one of the world’s great restaurants, Mr Keller, is remarkable: to create two smacks of genius. Per Se is on the floor which we English call the third and our American cousins call the fourth. I travelled upwards on the escalators, to gain some sense of this ultra modern building. It is large, airy and bright and exudes confidence and wealth. It also accommodates all sorts of enterprises, including – I am told – a very good hotel. This is the bold architecture of the extravert. I thought it admirable. 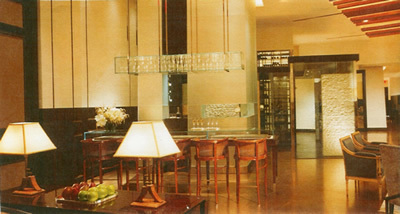 In contrast, the entrance to Per Se, through doors of darkened glass, is discreet. Inside, all is calm and comfortable, for this is an environment of muted greys and browns. I am not an invariable fan of Mr Adam Tihany. But here his design is a triumph. I walked through the bar and felt entirely at ease. Then I entered the dining room and knew at once that here I could enjoy myself. On two levels, connected by three steps, with a high ceiling and gentle lighting from spotlights, I found a sense of purpose and solidity about this chamber. Not that it is solemn – for its straight lines and surfaces of polished marble give it a happy hint of Art Deco. The tables are large, well-spaced and have white cloths. My own was by the fireplace and next to the plate glass windows. Through the latter I could look right across Central Park to the apartment blocks of the Upper East Side. I had been escorted to my table by Manager Paolo Novello, a gentleman from Turin who looked after me throughout the evening with exceptional grace and charm. As I settled into my chair, I noticed that, on the table in front of me, were top-quality Riedel glasses. These were what I had expected, for I knew that the General Manager of The French Laundry, the divine Laura Cunningham, had supervised the development of Per Se. And, for Laura, only the best will do. That approach is reassuring, is it not? It means that all the details are right – from the smartness of the waiters’ dark suits to the provision of both salted and unsalted butter for the delicious bread. It also means that the service (my own waiter was a chap full of smiles, called Michael) is not only friendly but also highly professional. Now, of course, it is my job – as a sour, fault-finding critic – to light upon something which is not to my liking. At Per Se I thought I had drawn a complete blank – until I noticed that new napkins were not brought when diners left the table for a moment. And that was it. Apart from this tiny omission, c’était parfait. Remarkable. And talking of perfection, we come to the food. Three menus are available: a 9 course vegetarian option, a 10 course tasting menu and a 5 course menu with choices. Each costs $175. Considering the expertise and work which goes into each dish and the surroundings in which the meal is served, this price must be considered a bargain. Each course is of modest size and is presented on the plate in a manner which is aesthetically pleasing. I chose from both the vegetarian and the 5 course menus. But I began and I ended, at my special request, with two dishes for which I will always be thankful to Mr Keller: his truffled egg (pictured) and his version of coffee and doughnuts. If you have never tasted these rich and luscious wonders, you must beg, beg and beg again for them to be available when you visit Per Se or The French Laundry. Your palate will be forever grateful. I sensed a rigid discipline in these dishes. They were not showy or crassly experimental. Instead, they were based upon the soundest of techniques and upon a profound understanding of ingredients. I confess that I hesitated about the partnering in my fish course: crispy-skinned alfonsino and tabbouleh (a Lebanese speciality, made from crushed wheat with tomatoes and onions). But it was utterly delicious, the fish not at all overwhelmed by its exotic partner. My meat course of beef – brisket braised in red wine – returned to more familiar combinations, including a bordelaise sauce. The conclusion to this lovely meal was, of course, the magical version of coffee and doughnuts. This last was washed down with a glass of 1986 Yquem – just one of the gems to be found on the impressive wine list, created by Wine Director, Paul Roberts. If you are a fan of 1961 clarets – and who, in his right mind, is not? – your knees will weaken as you turn the pages. Here are some of those you can drink at Per Se: Cheval Blanc ($1,850), Haut Brion ($2,600), Palmer ($2,000), Latour ($3,700) and Mouton Rothschild ($3,000). You do not have to spend a lot of money – a white from the Loire (Quincy, Denis Jaumier) can be had for $35 – but it is tempting to dig deep into the pockets when you spot the best from Italy, like 1997 Sassicaia at $500, or from Australia, like 1978 Grange at $1,120, or a half-bottle of 1988 riesling eiswein from my favourite German producer, Dönnhoff (Oberhauser Brucke), at $900. Sommelier André Mack brought me a fascinating chardonnay from Sonoma County, which oozed thick cream and yet, after a few minutes in the glass, managed to yield a nose of sweaty socks. Wonderful. (Kistler Vineyard, 2002 - $325.) And my red was even more intriguing, for this was ‘M’ – Mr Keller’s very own Californian cabernet. Not yet released for public sale, this was sternly structured, but still fat and complex, with aromas of wet oak and dank cellars. This is a very, very good New World wine. If, when it is released for sale, you can find any, my advice is to snap it up. It has the quality and provenance to be a cult wine, and its price will probably shoot up accordingly. New York is fortunate to have Per Se. 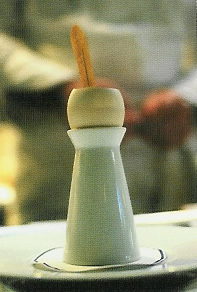 Its name, meaning ‘in and of itself’, suggests that it is independent of The French Laundry. And, indeed, it is. Its atmosphere is quite different. Yet it fully maintains the rigorous culinary standards of its Californian cousin. Thomas Keller, by dint of massive talent and boundless energy, has produced a second restaurant which is the equal of his first. I would not have thought it possible. But the evidence is there on Columbus Circle. The impossible has been achieved. Miracles do happen. I advise you to go and see for yourself. 10 Columbus Circle, 4 th Floor, Time Warner Centre, New York, NY 10019, U.S.A.